H T Howard & Co can offer conversions to up-rate cylinder heads to allow them to reliably run on either unleaded fuels or LPG. The main problem associated with either type of fuel where an engine was not originally designed with it in mind, is valve recession. Valve recession is caused by the additional heat generated when running on unleaded fuel or LPG. This extra heat causes the valves or valve seats to wear more rapidly than would be the case otherwise resulting in reduced valve clearances. If left unchecked this will result in poor running and loss of compression through burned out valves and worn or distorted valve seats. In severe cases, the blow past of hot exhaust gasses can completely burn out the valve, valve seat or even crack the cylinder head. Of the older vehicles designed to run on leaded fuels, the vast majority had cast iron cylinder heads which often contained no valve seat inserts at all. The valve seats were cut directly onto the iron from which the head was made. A few engines used aluminium cylinder heads (Jaguar, Lotus and Ford Lotus Cortina for example) but were often manufactured with poor quality valve seat inserts. In each case, the valve seat material was inferior to that of the valve and so is most affected by any increase in temperature of the combustion gasses passing through. This occurs when engines are run on fuel other than those for which they were originally designed. More recently there has been a trend towards both manufacturer and aftermarket LPG conversions. Often, the new fuel system is retro fitted and most of these converted vehicles do not receive any attention to the cylinder head components. In many cases, if the valves and valve seats are not up-rated, exactly the same problems of burned out valves and seats can result. In alloy cylinder heads, damaged valve seats can be removed and replaced with valve seat inserts made from a higher specification material. In exactly the same way, cast iron heads with damaged seat areas can be machined out and inserts fitted. 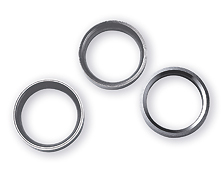 H T Howard source inserts of the highest quality from respected suppliers. Inserts of the correct specification can be purchased according to the application required. The insert housings are machined to exacting standards and the inserts fitted into the cylinder head to ensure a reliable repair. The valve seat angles are then machined on the new inserts. In conjunction with new valve guides, or bronze valve guide sleeves the cylinder head is ready to start its new life. All these machining operations are carried out using our Serdi 100 machining centre.